Christophe di Iorio is the manager and programmer of the Donkey Rock Festival in Sélange. The festival, which is in its 11th year, was born out of the passion for music of a few friends who wanted to revive the local table tennis club’s tradition for an annual large music themed party. 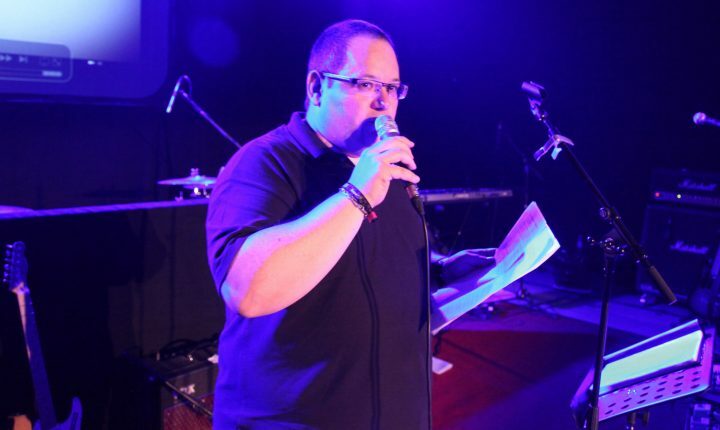 A big fan of amplified music and live performances, Christophe di Iorio is a regular participant in many live concerts and music festivals in our region. He is always eager to discover new sounds and bands to invite to the Donkey Rock Festival. As such, he remains open to all different kinds of music even as he readily admits that, personally, he is more inspired by post punk, cold wave, new wave, punk, punk rock or the French rock scene. The festival is actually a passion project for Christophe, who by day is an employee of the local government authority and whose daily responsibilities are staff and tax management. The pursuit of this project has, over time, taken on a more central role in Christophe’s life, a role which he gladly dedicates himself to as an expression of his love for his town and his region.